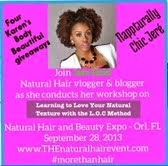 Nappturally Chic Jeré: 8 Reasons Why Natural Hair Rocks!!! 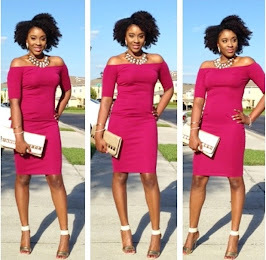 8 Reasons Why Natural Hair Rocks!!! 8) The Ms. Celie to Corine Bailey Factor (LOL)- I love how naturals can go to bed with ten big chunky twist in their hair at night, wake up, untwist, fluff, and style their hair into the most luscious, full, and beautiful hairstyle ever. How cool is that??!! 7) The Shake and Go Factor!! When I was relaxing my hair, if I started to shake my head wildly, my hair would look a HOT MESS!! 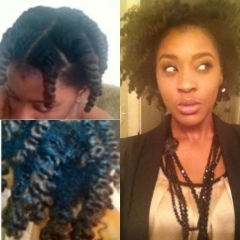 Now, the "Shake and Go" is my go to style manipulator when I untwist my hair. With Natural hair, we can embrace the frizz, big hair, and body. I love the shake and go!! 6) Natural Hair- Natural Living!! Going natural isn't just about a change of hairstyle, it is about a change in your lifestyle. When you start to pay attention to what you put on your hair and discover the dangers certain chemicals, parabens, and perservatives have on your hair, you start to translate that thinking into an healthier lifestyle. Most naturals start to pay attention to what they put into their bodies, drink more water, take supplemental vitamins, start working out, and eat cleaner. It goes hand in hand with the journey and that is so awesome!!! 5) You Saved How Much Money?? 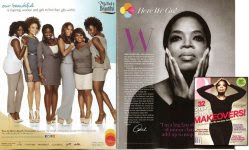 When I was relaxing, I was spending up to 700.00 a year to keep up with relaxers and deep-conditioning treatments. If I calculated the amount of money I spent on weaves and the installation of weaves I would probably fall out of my chair due to the craziness of it all. Now that I'm a naturalista, I have saved so much money! Even though products can be a bit pricey, the money I spend today pales in comparison to the money I spent when I was relaxing. 4) DIY Factor! There is something magically that happens when a woman embraces her natural hair; she suddenly becomes her own amazing personal hairstylist. I can't begin to tell you how reliant I was on hair stylist before I became natural. I couldn't live without my bi-monthly appointments for a wash and set and my touch-ups every six to eight weeks. Now, I'm my own favorite hairdresser. If there is a style I see, I re-create it and rock it. I know my hair better than anyone else and I have a personal stake in the insurance of its health... my hair has never been healthier and stronger. 3) When your Hair Gets wet, it gets awesome!! Who would have thought that H2O was so amazing!! Gone are the days of running and ducking from the rain, worrying about sweating during a workout, and going to extreme lengths to cover your hair during a shower. H2O is a natural girls best friend and it gives our hair and hairstyles LIFE!!!!! A simple a mist of water refreshes our curls, and is the foundation of all our styles. I will never miss the days of hiding from a drop of water in fear to what it would do to my freshly relaxed hair. 2) The Stand Out Factor! Forget what you heard, but us natural girls stand out in a big way. Even before I was natural, I couldn't help but notice the girl with the big fro, the bouncing curls, or fierce updo in the the sea of straight and flat hair. Our natural hair is a conversation starter, a question getter, a curiosity sparker, and I love it!! Whether it stands tall, wide, long, or full, it is beautiful and people notice it in a positive way. It is so easy to rock conventional forms of beauty, but when you decide to go against the grain, the fabulosity oozes out of you! 1) Versatility!! Versatility!! You can do so much with Natural Hair, from rocking a simple twist out to picking it out into a fro, to blowing it out or creating gravity defying updos. I constantly baffle people around me with the ease and frequency of my ever changing hairstyles. I can have straight blow-dried hair on Monday and decide to rock a tightly coiled/curly Fro on Wednesday... who else can do that, but us curly girls! 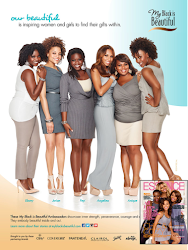 The Versatility of natural hair is also seen in the beauty of all our different textures, shapes, lengths, and styles... It is all so beautiful and it truly ROCKS!!! 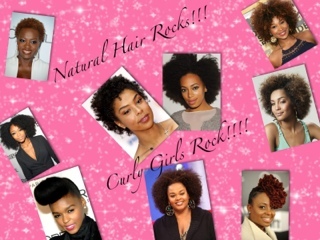 If your natural hair rocks, leave a comment explaining what rocks about it hair below! !